The villa is constructed with local stone, having ceramic floor tiles to the ground floor, wood flooring upstairs under wooden beamed roof with terracotta tiles. The spacious tiled terrace has magnificent views across the bay to Kalkan and is surrounded by a garden area with Bougainvillea, palms, cacti etc. Access is available to all of the amenities of the resort which include:- 3 Outdoor swimming pools (including one for adults only), 2 tennis courts, 3 restaurants and 2 bars, and water sports. The resort includes a health spa with Turkish bath, indoor plunge pool, beauty salon. All guests receive a 25% discount on all food and drink consumed in the resort. For day to day needs there is a well stocked supermarket within the resort grounds. Along the seafront there are rocky ledges with sunbeds for sunbathing and direct access into the clear turquoise sea. The resort is on a hillside but there is a free courtesy bus which runs up and down the resort throughout the day and evening. 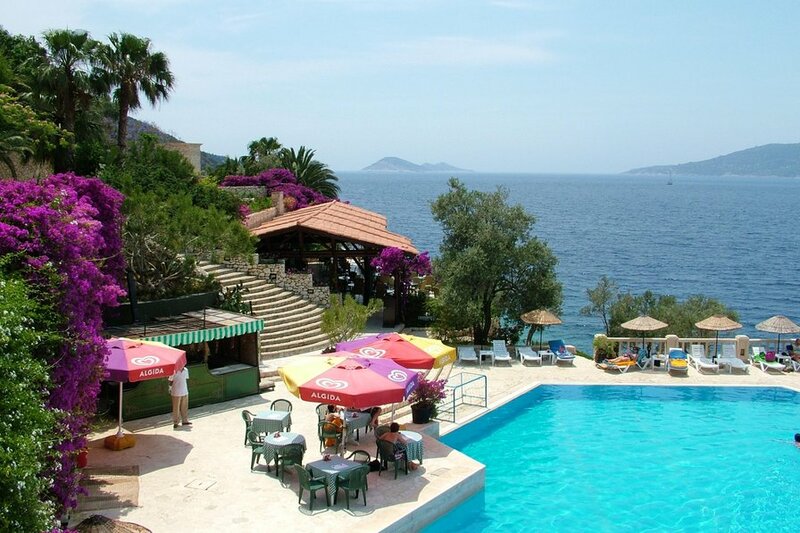 The resort is across the bay from Kalkan and a water taxi service is run at a small charge. Kalkan is only a 25 minute walk from the villa with magnificent views all the way. Kalkan is a small harbour town with an unspoilt old town area leading down to the marina. It has an increasingly sophisticated character which remains unspoilt. There are numerous restaurants serving superb cuisine to suit all pockets and numerous bars and boutique shops. However it is predominantly a resort for families and couples with only a few low key night clubs. There is a small town beach and two magnificent beaches nearby at Patara and Kaputas. Patara beach is a national park having 11 miles of unspoilt sand backed by huge sand dunes, however there is an area with sunbeds and a cafe and toilet facilities. The property and resort suites families and couples. However due to the hillside location with many steps it does not suit wheelchair users. The wrap around terrace is a feature of this villa with unobstructed far reaching views.